Windows Vista is released commercially for retail purchase in stores’ shelves since January 30th, 2007 onwards. 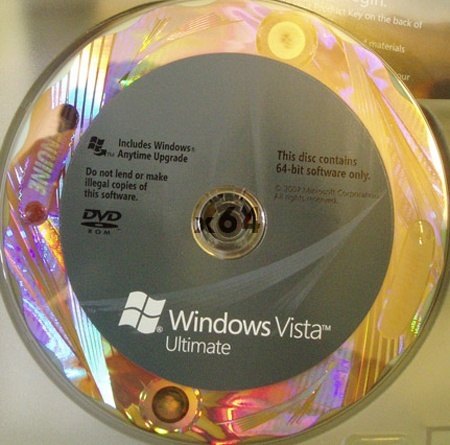 And good Samaritans (or pirates) have spent $422.99 ($399.99 plus sales tax of $23.00) to buy the 32bit and 64bit (x86 and x64) edition of Windows Vista Ultimate DVD media, and the rip the Windows Vista Ultimate DVD disc as ISO image and distribute the Windows Vista Ultimate full retail release DVD image via BitTorrent P2P network for everybody to download. The retail release of Windows Vista should be also the RTM release of Windows Vista, where one of the popularly shared edition of Windows Vista RTM is MSDN version. All Windows Vista DVD media are almost the same or similar regardless of which version (upgrade, full or OEM) or edition (Starter, Home Basic, Home Premium, Business or Ultimate) of Windows Vista your purchased, probably as part of Windows Anytime Upgrade program. The only thing that matters is Windows Vista product key which will determine which version and edition of Vista you can use, activate and validate with WGA. So you can use this Windows Vista Ultimate DVD ISO image to install any edition of Windows Vista edition you want. Torrent contains case_01.jpg, case_02.jpg and LRMCFRE_EN_DVD.iso files. Torrent contains case01og2.jpg, case02xx3iy1.jpg, LRMCXFRE_EN_DVD.iso, LRMCXFRE_EN_DVD.md5 and x64.jpg. * Some model from the processor series might not support 64-bit instruction. The downloads do not contains any crack or serial product key. To activate Windows Vista, you have to purchase Windows Vista license and be given a genuine valid product key. Else you can temporarily instead without any serial key for evaluation usage up to 120 days (by rearm up to 3 times) or search for anti WPA or activation crack for Windows Vista.